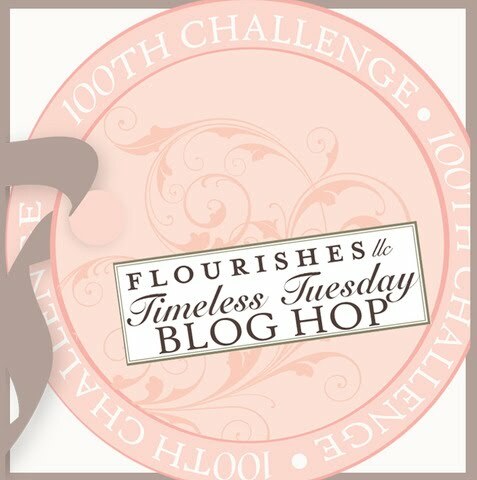 Dina Kowal Creative: Flourishes Timeless Tuesday 100th Challenge Blog Hop! Flourishes Timeless Tuesday 100th Challenge Blog Hop! This weekend Flourishes is celebrating their 100th challenge, and they've invited their devotees to participate in a blog hop! If you've linked to my blog from Flourishes, I'm glad you stopped by! This week's challenge is to incorporate "favorites" into your project. It wasn't required to use Flourishes stamps, but I did a bunch of watercoloring last weekend when we were in the hotel, and happened to paint up this favorite, from their Strawberries set. Watercoloring is a favorite pastime and coloring method for me (I used Derwent watercolor pencils)..... before I filled in the strawberries, I carefully dotted the strawberry seeds with a clear glaze pen (Sakura). I used a new favorite technique on my image - cutting along edges within the image, and embossing from the back side of the panel with a large stylus to create dimension in the piece. The raised areas are 'filled' with glue on the back so they keep their form. Vintage and shabby chic are a bit of a favorite fall-back for me too, and I used a more neutral, vintage palette on the image. Enjoy the hop, and enjoy your weekend! Congratulations, Flourishes!! Hi Dina! Oh this is so gorgeous! I'm loving the seam binding and vintage feel! Love the paper tole too! Dini, this is gorgeous and so beautifully colored! Wonderfully done! Thanks so much for celebrating Flourishes FTTC100th with us! Hi Dina!! Lovely card, it's so nice to come across your blog through this Flourishes hop!! Beautiful! What a fantastic card! So pretty and spring like! Love it!! This is gorgeous Dina..Thanks for the tip on the technique. This card is just stunning! I love everything about it! The paper, the lace, the bow. It's just perfect! Fantastic job! Beautiful! Love the soft coloring on the strawberries, and I love your tip for creating dimension- going to have to try that! I love the puffiness and texture of your ribbon! Lovely card. oh, my goodness! WOWZERS!! Your card is amazing! *Jaw dropping! * Absolutely stunning! I love the soft, subtle watercolurs, your detail in the embossing... the card is simply gorgeous Dina! So pretty!!! Your coloring is wonderful. I love your papers and your ribbon too. Stunning coloring on these gorgeous strawberries Dina! I just got a set of Derwent Watercolor pencils so I'm learning how to play with them ....so different from reinker watercoloring but fun! This is really pretty. The ribbon is a perfect finishing touch! Love it. Beautiful card, beautiful colors. Love the ribbon and the whole design!! Looking at your beautiful light coloring on your card inspired me to go do some more watercoloring. I love the affect. I love what you did to bring out the "seeds" on the strawberries. Love the doily, too. Lovely. LOVE this card!!! The beautifully painted image, the embossing, the layout, the embellishments--all absolutely wonderful! Gorgeous!! I love the layout, papers,and really pretty colorin. This is wonderful! Your coloring is amazing. It's really evident that you enjoy it! Beautiful card! I love the strawberry set. Your colors are wonderful! What a lovely card, love the watercoloring, one of my favorites to do. OMGoodness! This is gorgeous! Thanks for playing the FTTC100 challenge! Love the strawberries!!! And I love the ribbon too!!! Beautiful card, Dina! I LOVE how you did that embossing to raise the image! Great detail! Beautiful colors and textures and patterns....gorgeous card! This is sooo beautiful! I love all the layers! Your patterned papers are just perfect for that stamp! Wow--I love what you did with this image. It's the same one I used, but you used watercolors. I love your idea of dotting the seeds. That's a good tip! This is gorgeous! What pretty pinks and scrunchy ribbon. I'm practically speechless. I love the big, fluffy bow and the treatment you've given the image is phenomenal. Is there a tutorial somewhere? I would really love to learn how to do that. I love your watercoloring. It's so pretty and vintagey looking. Very elegant! Gorgeous artwork! That's a neat way to achieve added dimension! Truly creative & inspirational! Oh my goodness!! I love your water coloring work Dini!! Beautiful shabby chic look and detail!! Thank you for playing the FTTC100 Blog Hop with us.